I love Frank Delaney, so when Radom House offered me the chance to review his latest novel I jumped on it. I was not disappointed. Delaney offers his readers an Irish tale of love, betrayal, and redemption. It is a coming of age story; the coming of age for a young independent Ireland and a young man who must grow up much faster than most. Ben MacCarthy is given a piece of advice from his mother that sets the tone for the novel: there are two ways to see things. See them as they are or as they seem to be. When Ben’s father falls for Vernita and her vagabond life the reader must decide if he is seeing her as she really is or how she seems to be. As Ben travels in search of his father the reader learns about the politics and values of 1920 Ireland; the Ireland that is, and the Ireland that seems to be. The characters introduced are both very human and mythical. Delaney has a way of making his readers fall for all of his characters and yearn for more. This is not a quick read; Delaney, a true Irish story teller. He takes his readers on small side journeys and cannot tell a short or small tale. He tells a story before getting to his main point and at times veers from his tale in order to introduce characters, only to come back to them later in the novel. This can be frustrating for those who like a linear tale, but for those who love true story telling, this is a must read. 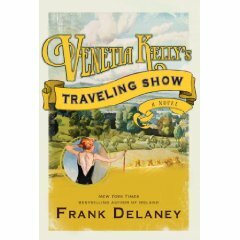 Following Venita Kelly is one of the best adventures you will embark on this year. Previous Previous post: Weekly Geek time, To know an author is to read more?